Browse all lot sizes for SilverTowne 10oz Trademark Logo Silver Bars. The Trademark image of the Prospector and Donkey is why some collectors know these silver ingots as "SilverTowne Donkey Bars" or also as the "SilverTowne Logo Bars". 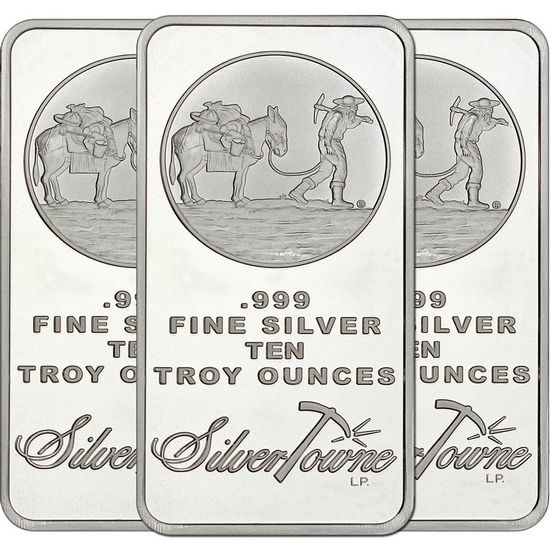 The obverse design features the SilverTowne Trademark prospector and his trusty burro on the front in a perfect circle with the SilverTowne logo at the bottom along with the silver purity and weight designation of ".999 FINE SILVER TEN TROY OUNCES". The reverse is a crisscross waffle pattern with the SilverTowne Logo and Donkey and Prospector again in the center. 10 Troy oz ingot custom minted in .999 pure silver at the SilverTowne Mint in Winchester, Indiana. Product will arrive in heat-sealed plastic. Ten Ounce Silver Bullion Bars the most common larger silver bar size (100 oz are a common size as well but due to size are less commonly affordable for bullion stackers). At 10 ounce increments, premiums are much cheaper per ounce. Also, due to the 10oz size, bars like these are easy to stack and store in home safes. See all available lot sizes for 10oz SilverTowne Trademark Logo Silver Bars. The SilverTowne Trademark 10oz .999 Silver Bar 3pc is a SilverTowne Mint Minted Bullion Product. Located in Winchester, Indiana, The SilverTowne Mint has been manufacturing quality Silver Bullion produced with the Highest Quality Standards since 1973. When purchasing the SilverTowne Trademark 10oz .999 Silver Bar 3pc on SilverTowne.com you are buying direct from the source! The SilverTowne Trademark 10oz .999 Silver Bar 3pc is a SilverTowne IRA Approved Product. Collecting physical silver, gold and other precious metals is a great way to diversify your holdings. For more information on adding precious metals to your portfolio visit SilverTowne.com/IRA or call 1-877-477-2646.